Also called Champakulam Kalloorkadu St. Mary’s basilica, St. Mary Forane Church is the oldest Christian church in India. 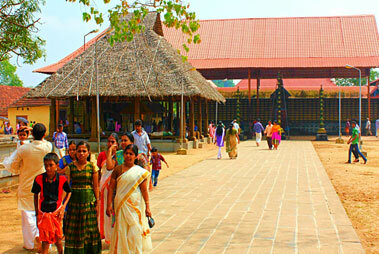 It is located in Alleppey district and is known to be the mother church of almost all Catholic Syrian churches. This church is known to be the first one under the churches at Niranam that is said to have been founded by St. Thomas, the Apostle himself. Stories state that St. Mary’s Forane Church was erected in the 9th century on a land that was offered by the Brahmin family of Ettanasseri. It was a token of thanks for the make heir that was born in the family after prayers to Virgin Mary. The Statur of St. Sebastian that is placed inside the church is believed to be brought here by Leonard D'Cruz by Portuguese sailor in the year 1687. One of the highlights of this church is the unique crucifix where St. Sebastian is shown sans any injuries. In the year 2016, the church was made a Basilica and also was the first in the archdiocese of Changanasserry. St. Mary’s Forane Church is the 9th basilica in Kerala and 23rd in India. This church is also the 4th Syro-Malabar basilica in the country. The church has been a significant player in the history of Indian Christians, mainly South Indian Christians. The building of the church is in a beautiful white color. The architecture of St. Mary’s Forane Church is quite regal and is a combinations of Portuguese and Syrian Christian styles of architectures. It is believed to be the cause of reconciliation between Catholic and Jacobian Syrians 3 centuries ago. The church is known to be the carrier of Christian heritage in India. The main festival at the St. Mary’s Forane Church in Kottayam is the annual feast given in the honor of Saint Sebastian, known for fireworks. Devotees give gold and silver arrows set as offerings. The 4-star establishment Lake Palace Hotel Alappuzha is located amidst beautiful, calm and serene . . . Read More..
Abad tutle Beach Resort in Alappuzha, is surrounded by charming fishing village, and offers the . . . Read More..
Citrus Retreats Alleypey, a four-star establishment in Alappuzha, is a stunning retreat zone during . . . Read More..